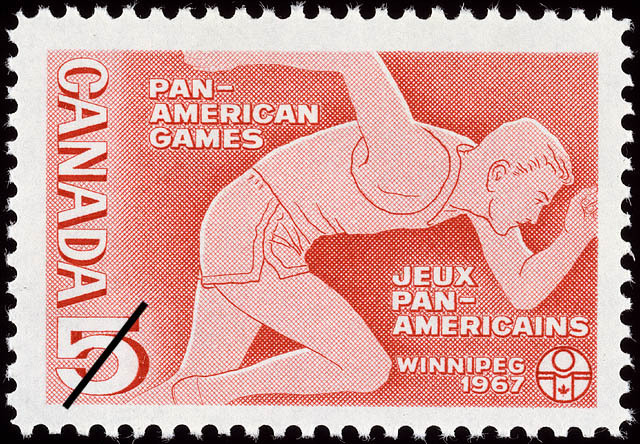 The value of a Pan-American Games, Winnipeg, 1967 - 5 cents 1967 stamp depends on several factors such as quality and wear, supply and demand, rarity, finish and more. Values in the section are based on the market, trends, auctions and recognized books, publications and catalogs. This section also includes information on errors and varieties and characteristics. The 5th Pan-American Games, a major Canadian Centennial year event in Winnipeg were commemorated by this Canada Post Office 5 cents stamp. Duration of the Games is the July 22 to August 7, 1967. Brazil was the host country in 1963 when the event was staged in Sao Paulo; Chicago, U.S.A, was the site in 1959; Mexico City, Mexico, staged the event in 1955 and the first in the series was held in Buenos Aires, Argentina, in 1951. This Canada's 1967 Pan-American Games stamp includes in its elements a reproduction of the 1967 Games symbol. It represents a competitor with the Canadian Maple Leaf on his shirt; his arms are outstretched in a sign of welcome to the contestants and visitors from many countries. First Day Cover service for the Pan-American Games stamp were provided at the Winnipeg Post Office.